MIDORI SCALP BALANCE EXFOLIATE & TREATMENT 2X60ML – HAIRDEPOT - Hair & Scalp Care Products, Prevent Hair Loss, Shampoo, Conditioner, Treatment, Styling, Appliances and more! Midori Scalp Balance Exfoliating Treatment containing a combination of powerful exfoliants to dissolves away the effects of aging. 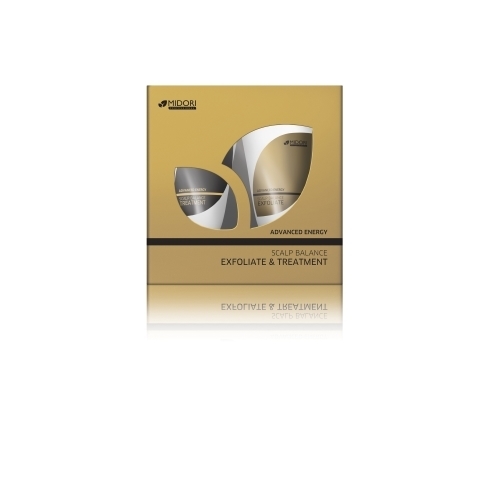 This exfoliating treatment adds density and strength to hair. Immediately soothes and stimulates the scalp to provide a healthy scalp environment. Distribute evenly onto scalp. Gently massage for 2-3 minutes onto the scalp. Rinse off. Shampoo out with Scalp Balance Shampoo. For optimal results, follow up with Midori Scalp Balance Treatment. Midori Scalp Balance Treatment helps to soothe, calm and nourish the scalp. This scalp balance treatment contains moisturizing ingredients and enriched with a cooling agent for a refreshing sensation.